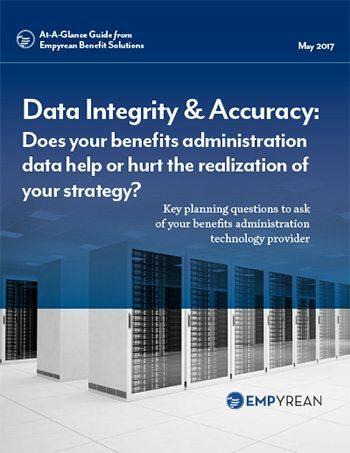 Data Integrity & Accuracy: Does Your Benefits Administration Data Help or Hurt the Realization of Your Strategy? One of the most challenging aspects of benefits administration today stems from managing the many complexities of employee information from the perspective of preserving data integrity. When choosing an outsourced benefits administration provider – or auditing your current provider – it is important to assess that their underlying technology capabilities and infrastructure are capable of assuring data integrity and accuracy. We define data integrity in the context of benefits administration as maintaining and assuring the accuracy and consistency of employee data over its entire lifecycle. Your data must be as correct and up-to-date as possible, both when it is initially loaded into a system and going forward within the system. Data integrity is essential because errors or gaps in your data can leave you open to risks and require unanticipated corrective action down the road, which can drive up your costs. Inaccurate data, for example, can cause overpayments for ineligible dependents, wrong tier coverage classification, or misreporting on Affordable Care Act (ACA) compliance, which can lead to significant penalties in monetary fines. This At-A-Glance examines several operational and technological data aspects to consider when evaluating your benefits administration options, to help you find a technology solution that will consistently fit your needs. These questions will help you set expectations and enable you to make better decisions in seeking to improve your employee benefits administration. Question 1: How does your benefits administration technology affect the quality of your data? Data is generated by your organization every day. How your HR and information technology (IT) operations are structured has a significant influence on your data strategy when it comes to improving your benefits administration, handling complexity, and remaining agile enough to accommodate constant changes. For most organizations, HR professionals are not expected to be especially adept at the nuts and bolts of technology practices, architecture of systems, and data flow. In the same way, technology professionals are not expected to know the ins-and-outs of employee benefits issues such as ACA and disability plans. However, we find that the most successful HR teams maintain a collaborative and regular conversation with their internal IT staff or provider(s). Technology may introduce organizational and process changes to automate or perform existing tasks better, faster, and smarter. Technology should serve you and make your job easier. Technology that is specifically designed and continually supported by HR expertise will increase the reliability and accuracy of your data. Why? The best technology systems run constant quality assurance (QA) checks to catch errors in data. If QA is not being performed regularly, or without a complete understanding of the data’s context to HR operations (i.e. exempt/non-exempt, Union/non-Union), small errors may compound over time – causing costs to skyrocket and coverage accuracy to be in question. When the data in your system is thoroughly accurate, you can rest assured that your benefits administration costs are stable, your team can save time, lower risks, and alleviate headaches by minimizing tedious manual processes, and your employees will receive a more engaging and informative benefits experience that aligns with your benefits strategy and goals. However, not all benefits administration systems maintain the same level of rigorous data quality control. Therefore, it is important to gain a high-level understanding of the processes your provider uses to ensure data accuracy and integrity. Are most tasks automated, or do they require manual (and error-prone) work to ensure functionality? What QA processes and schedules are in place to ensure that clean data is maintained and that errors are caught? When reviewing these topics, it is also crucial to determine if the processes being used are capable of seamlessly scaling to fit your organization and maintain good data as your company grows and evolves over time. Question 2: Does your benefits administration technology compensate for different inputs of employee data – and check it constantly for integrity and accuracy? When you go to a restaurant and order a meal, your wait staff has a profound effect on your dining experience… arguably just as much as the food itself. Think of your benefits administration technology platform as the wait staff helping to deliver your benefits administration strategy. You need an accurate running tab of how many plans are being served and in what configurations. Your employees want their plans confirmed, priced correctly, and served perfectly. However, each employee’s “order” will vary depending on their needs. Your employees may choose medical coverage (their main entrée), ancillary benefits like dental and vision coverage (appetizers), and additional voluntary products such as pet insurance (dessert). They may also add dependents and choose to divide their beneficiary allocations in a specific way. Just like in a restaurant, the expectation is that each employee’s benefit order – regardless of complexity – is served correctly. Similarly, utilizing a well-designed benefits administration platform helps to ensure that employees’ benefit elections are correctly administered and managed. If not properly prevented and attended to, data issues can pile up in the background of your system, causing difficulties down the road. When clients are migrated from a previous platform to the Empyrean Platform, we can often see where their prior technology vendor compromised processes and made it difficult to timestamp data, identify missing or incomplete data, and keep accurate audit trails for both employee and administrative actions. Additionally, problems within your data can make running accurate reports on a regular or ad-hoc basis an unnecessarily arduous undertaking, when it should be fairly straightforward. We also see clients that come to us with inflexible options for managing variable pay frequencies, unable to transfer from hourly to salary/exempt, and vice versa, or easily manage many employee bands (multiple states, Union/non-Union, etc.). Without a dependable partner and system in place, it can be almost impossible for benefit teams to identify these issues before they come up. This is why it is crucial that your partner reliably maintains your data at all times. When it comes to your benefits administration and providing a solid, seamless employee experience with data they (and you) can trust, you should not have to compromise. Question 3: As the complexity of your data and operations increase, how do data integrity and accuracy issues impact your department’s-and ultimately your company’s-bottom line? The needs of your business, your staff, and your employees change almost daily (if not hourly or by the minute!). Your system should be able to handle a rapid rate of change, but also handle the equally rapid rate of complexity that increases with this change. Some legacy systems can be altered to manage these changes, but only by adding substantial costs and additional personnel to attend to them. Other technology systems can manage simple plans, but once you introduce more complexity and demands into the process, that technology often breaks causing data errors and requiring a seemingly endless list of compromises to compensate for these failures. For instance, an employee may get married, later add children, change salary bands, move to another state…the possibilities are nearly endless. Regardless of the events and timing that alter an employee’s election options and eligibility, your system should be able to automatically calculate the correct pricing and coverage options for that particular employee – no matter how they enter their data throughout the process. On the carrier side, smart systems also coordinate and simplify the organization and presentation of data from different carriers, and manage those separate carrier technologies seamlessly behind the scenes. How is your current system designed to protect the integrity of your company and employee data, deliver flexible and ad-hoc reporting, and predict and resolve data integrity issues? Some legacy technology providers have patched and bolted different systems together over a number of years, making it very difficult and expensive for them to handle the multi-dimensional complexities of modern benefits administration. Other technology companies handle non-complex plans and bands well, but quickly show strains under business or operational changes such as an acquisition, the addition of new benefits, or employee engagement options. Over ten years of serving leading enterprises, the Empyrean team has dissected thousands of processes to design and engineer the most efficient and accurate technology platform available, while understanding and adapting to key HR processes as they evolve, maintaining data integrity and ensuring regulatory compliance – even in the most complex of company and employee scenarios. Conclusion: Expect your benefits administration technology to adapt to your needs, not the other way around. A properly designed and well-built technology architecture can easily handle the many complexities associated with managing and keeping your employees’ benefits accurate and up-to-date. Behind the scenes, a robust system is programmed to execute the exact sequence or actions necessary to handle any event and contingency with logic and rules-based capabilities – no matter how an employee proceeds through the benefits administration process. All benefits administration providers serve similar business needs, but the technology they use differs greatly. The quality and adaptability of their technology and processes will determine your service outcome – and ultimately your and your employees’ experience. The Empyrean Platform is designed and maintained on our own proprietary technology, built from the ground up to ensure our solutions have the flexibility, adaptability, and scalability required to meet clients’ unique and ever-changing needs. From making ERISA changes and managing Evidence of Insurability (EOI), to processing and aligning life events to federal and state regulations, the Empyrean Platform has the intelligent systems necessary to handle day-to-day demands and unique exceptions alike. Our client-adaptable system puts all processes and employee actions in the right order and with the right determinations, while taking into account the 100, 1,000, or 10,000+ bands of complexity required to get each employee’s costs, coverage, and compliance variables calculated correctly. As an HR leader, you’re tasked with making sure your employee benefits data is correct, timely, and reliable. We invite you to have a deeper conversation about your current technology system to help you audit your data and processes. If your system’s functionality and data processes are failing, or aren’t flexible enough to meet your needs today and in the future, it may be time to consider other options. Contact us to learn more about how client-adaptive technology can improve your data management, minimize your burdens, and enrich your employee experience for more effective and efficient benefits administration.